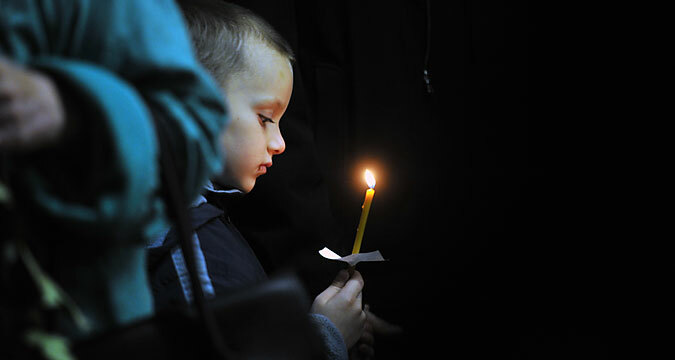 A boy at a funeral service for a victim of the A321 crash, at a church in Veliky Novgorod. Some of the victims have yet to be identified and buried. How families and friends of those killed in the terrorist attack on board the chartered Russian airliner over Egypt's Sinai Peninsula on Oct. 31 are coping with their grief. A month after a terrorist attack in the skies over Egypt’s Sinai Peninsula killed 224 people, Anna Sviridova is still a flight attendant. “I’ll stay at my job, and I don’t need to be convinced otherwise,” wrote Sviridova, the widow of flight attendant Stanislav Sviridov, who was killed in the air crash, on the social network site VKontakte. All 224 people aboard the Russian Airbus A321 flying from Sharm el-Sheikh, Egypt to St. Petersburg were killed when it crashed on Oct. 31. Of the victims, 130 were St. Petersburg residents; 25 were children. Victims are still being identified and laid to rest. Families are still reeling. But the city’s response shows how far it has come since 2006, when another plane traveling to St. Petersburg crashed, killing 170 people. Hundreds of people came to the city’s main square in the wake of the Oct. 31 tragedy to mourn the victims. Spontaneous memorials have popped up in Pulkovo airport and on the Palace Square. Sviridova's unbroken spirit is rather an exception. Most of the victims’ relatives remain reticent to talk with the press. Lives of families of those perished over Sinai are now divided into "before" and "after." In St. Petersburg, the flowers and toys at the Palace Square and the Pulkovo Airport were removed ten days after the tragedy over Sinai, marking the city’s attempt to return to daily life, however bereaved families are still struggling with what daily life looks like. The gifts and flowers and teddy bears were moved to the morgue on Shafirovsky Prospekt where remains of the unidentified victims are still kept. Irina Kuzina, who lost her aunt, Nadezhda Bashakova, 78, and cousin, Margarita Simanova, 53, in this tragedy, told RBTH that the family is still waiting for the body of the latter, and there has been no funeral yet. According to official data as of Nov. 17, when the Russian authorities officially confirmed that the cause of the crash was a terrorist attack, 58 people had been identified and 47 buried. Kuzina thought the disaster was a terrorist attack even before the official announcement. "I did not believe that it just broke up in the air ... You can't bring people back, and to [establish] the cause is the last thing that really matters," she says. Simanova's son is entitled to monetary compensation, but according to Kuzina, the money has not yet been received. Alexander Rzhanenkov, head of the city administration's Committee for Social Policy, said that city authorities will help families in dealing with property issues, mortgages and loans taken by the people who were killed in the crash. "Twenty-nine families have already received 33 million rubles (about $500,000) from the city budget, we hope that the payments will be completed by the end of the year," Rzhanenkov told RBTH. Nine years ago, on Aug. 22, 2006, St. Petersburg survived a similar tragedy. On a flight from Anapa to St. Petersburg flight Tu-154 encountered a severe thunderstorm and crashed in the Donetsk region in Ukraine. The crash killed 170 people. Marina and Alexei Shteinvarg lost two daughters in the disaster; Marina's parents were killed, too. Today, the Shteinvargs have three children born after the crash, but they keep the pictures of the deceased sisters and grandparents in a prominent place at home, honoring their memories by helping other families going through similar disastrous situations. The two are volunteers of the Interrupted Flight NGO created a few months after the disaster by relatives of those who died on that flight. Nine years ago, the Shteinvargs went through the grueling identification procedures – both visual examination and identification of DNA – that the relatives of the A321 crash victims are going through now. But they say that the level of solidarity in the Russian society was far lower. Psychologists at the Russian Ministry of Emergencies do work with family members until all the victims of the tragedy are recognized and identified. Then they must pass on the responsibility for all the families of the victims to St. Petersburg's psychological support services. Psychologists at the Russian Ministry of Emergencies reported that they were contacted more than 3,300 times in the five days after the disaster. In order to provide long term assistance, Interrupted Flight opened a center in St. Petersburg in 2010 for free psychological support for relatives of victims of disasters. The center initially received a small subsidy from the Committee for Social Policy, but has not needed that funding for the past three years.